This 18-member orchestra was formed from among Canada's top studio players to meet a growing demand for the music and arrangements of legendary bandleaders Glenn Miller, Tommy Dorsey and Harry James. The runaway success of the many Spitfire albums is hardly surprising, considering the enduring popularity of swing music, and the quality of the band's renditions. The band has performed at venues across North America including New York's Lincoln Centre, The Metropolitan Club and a one year run at The Imperial Room in Toronto. Composer and arranger for the band is Micky Erbe who co-founded the band has appeared with numerous big bands and has recorded with artists such as Anne Murray, Glenn Campbell and Nana Miskouri. Recipient of four Gemini Awards, three SOCAN Awards and multiple Gemini and Genie nominations. Micky has also performed with such artists as Tony Bennett, Leslie Ugamsand Willie Nelson. Laurie Bower who also co-founded and plays trombone in the band is also a noted singer/vocal arranger. Laurie formed the very successful Laurie Bower Singers who recorded 13 albums and performed in numerous cities in North America, Australia, Britain and Japan. 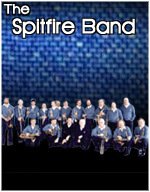 The Spitfire Band described by one of their corporate clients as "the best swing band in North America" continues to delight fans across the country. Their CD's sell consistently and they are regularly invited to perform for some of the most prestigious events in North America.